I have been doing a lot of gardening recently. 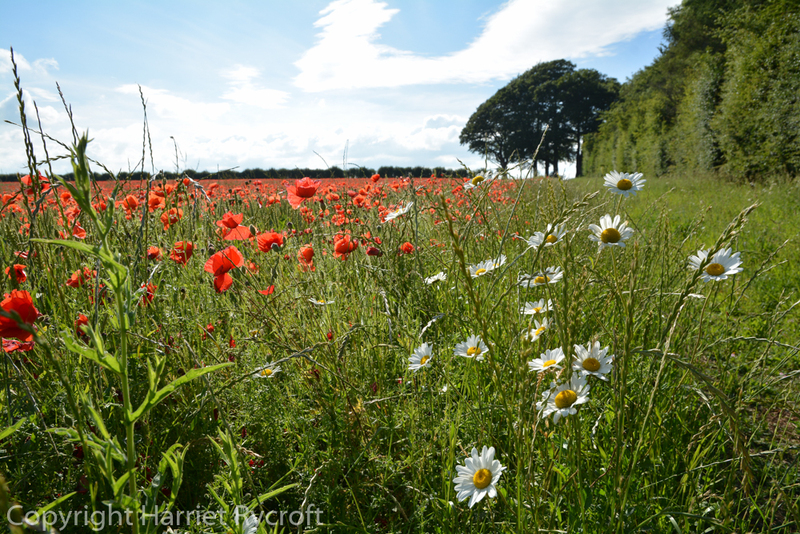 Gardening is normally pretty high on the agenda but in June it reaches peak levels. I’m in the middle of replanting most of my 300 pots, and I’ve been doing some extra work this month at the Cotswold Wildlife Park and Gardens, as we lay out and plant all the summer bedding and containers. It has been hot work, we have drunk gallons of water every day to survive, I have taken to wearing a headscarf soaked in water, the team has a glazed and punch-drunk look now and lunchtime banter has sunk to minimal levels. 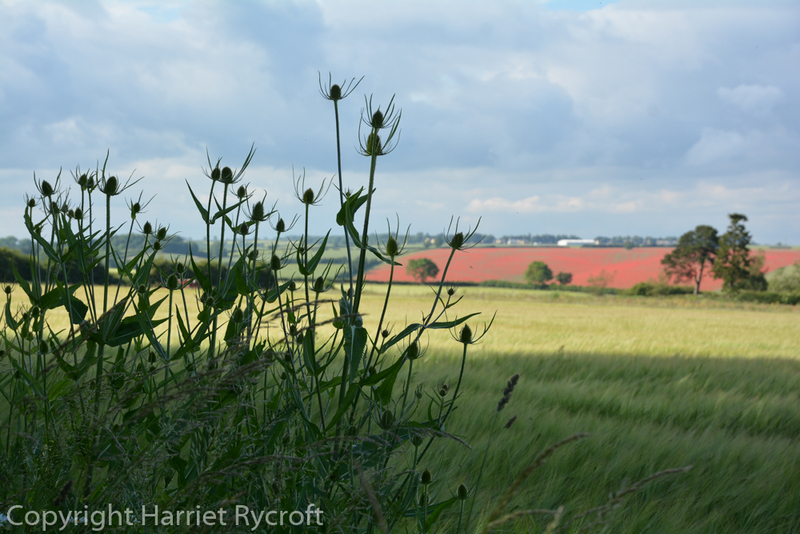 Even after eight hours with my hands in soil, my head in plants and my backside in scorching sunshine, dying for a cool shower, I can still be stopped pretty much literally in the tracks of my homeward journey by a glimpse of red through a field gate. 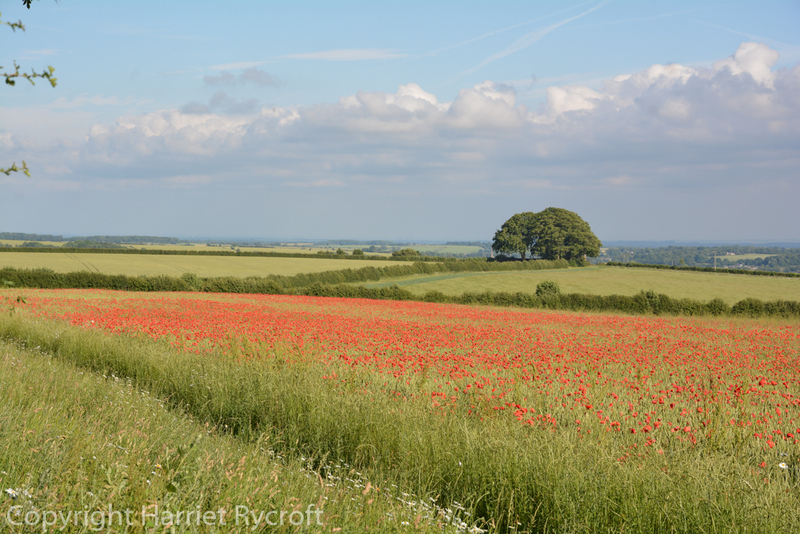 On several occasions recently I have taken speculative detours to see if I can get closer to the poppy fields which have appeared as if by magic in the Cotswolds countryside visible from the A424. 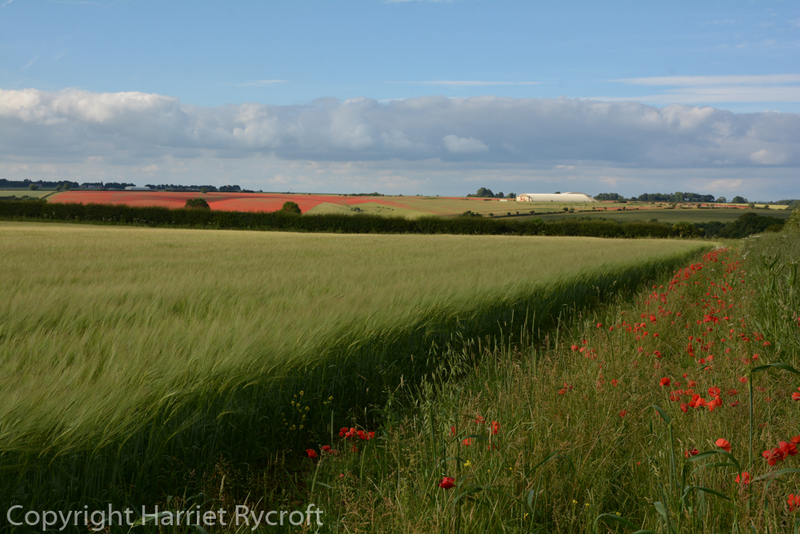 This is when I am especially grateful that our country has such an extensive network of footpaths because a short walk around a heat-bludgeoned field can bring you face to face with the brightest of reds fluttering and shimmering among the wheat or barley. 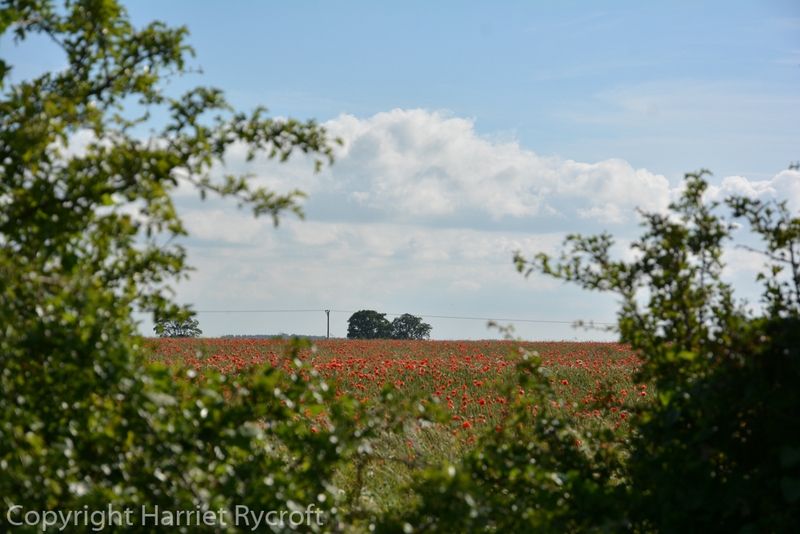 Just a glimpse over a hedge – if I walk a bit further, can I see more? 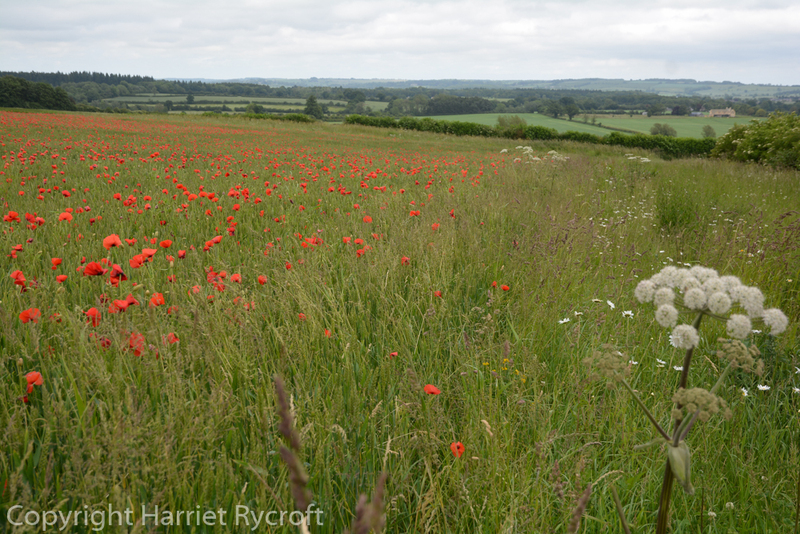 I don’t care that my boots are full of grit, my hair is stuck to my head and my back aches. The detour and the extra walk was worth it! That colour isn’t used as much in gardens as it could be, I think it alarms people. I use a lot of red in containers because I enjoy its invigorating effect but it can eclipse less assertive colours. 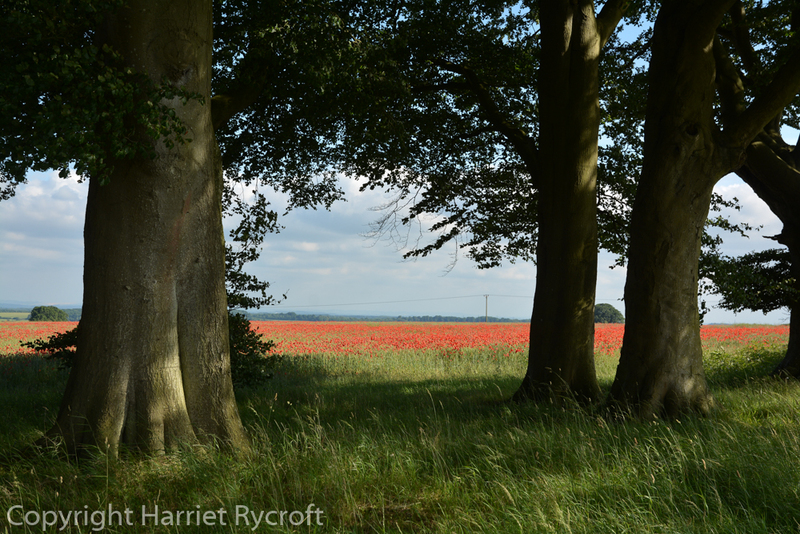 In acres and acres of rolling countryside the bright red of the field poppy, Papaver rhoeas, outdoes everything else. 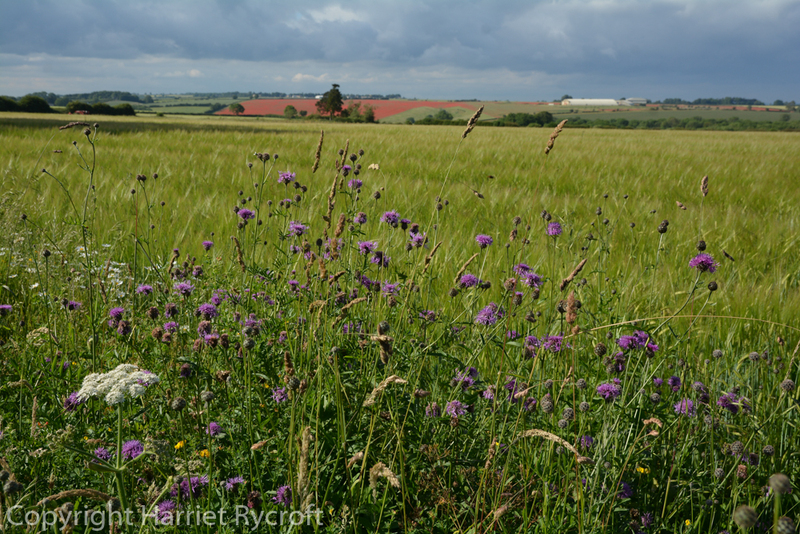 Knapweed, chicory, scabious, bird’s foot trefoil, even orchids pale into insignificance. 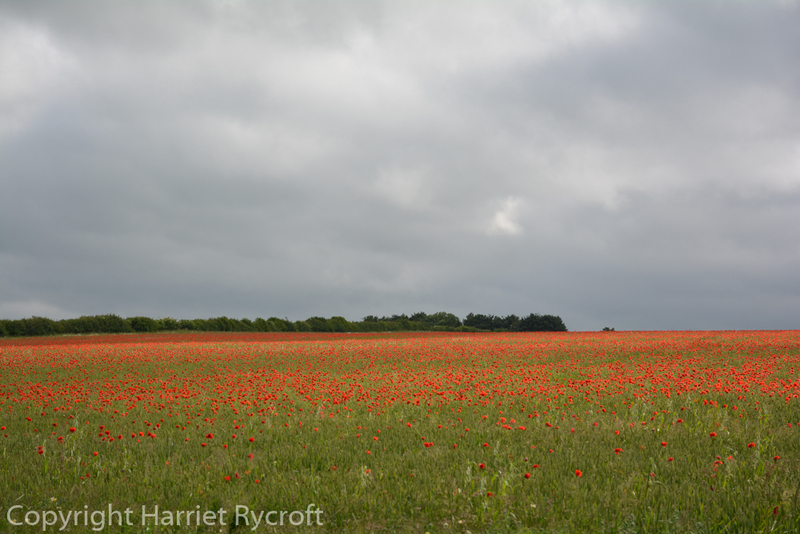 If there’s a poppy field in the scene, or just a single poppy, your eye is drawn to it. 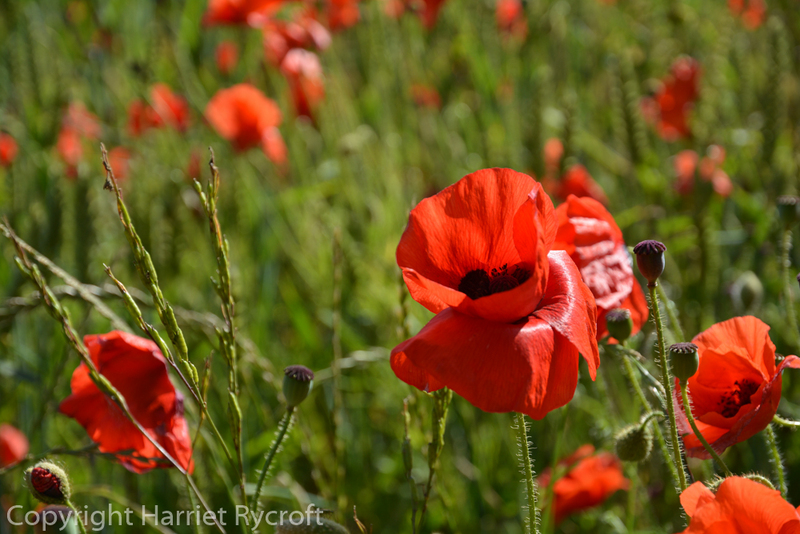 More subtle wildflowers can take heart, however as the poppy’s reign is brief, especially if we get a few showers of rain (ohh, please…). Scabious in my face, but look over there! 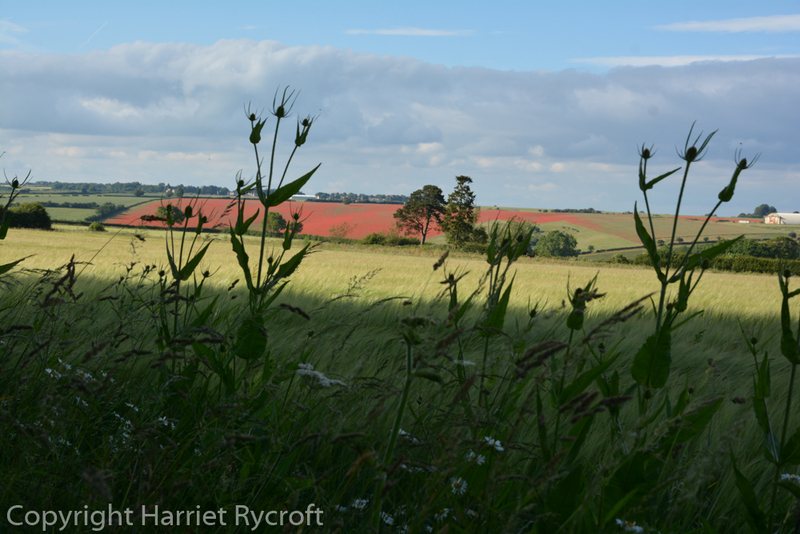 Nice try, knapweed, but I’m still looking at the poppies in that distant field. 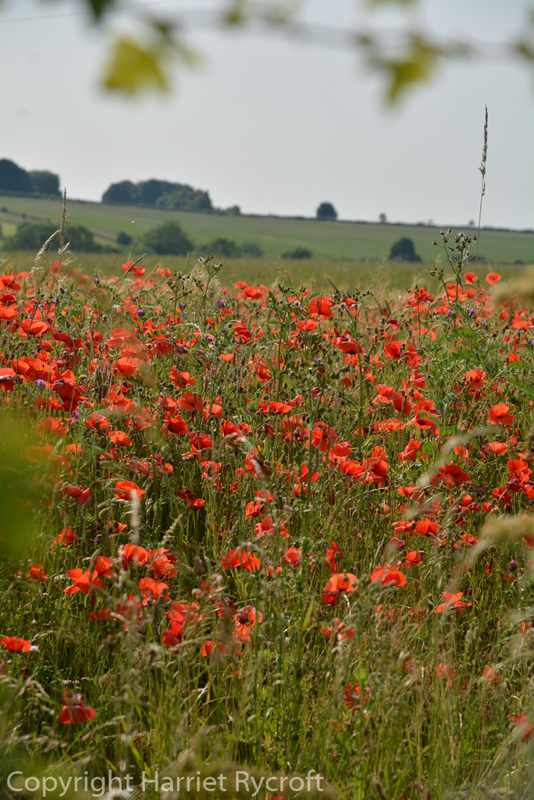 Is it simply a good year for the poppy? It seems to be a good year for everything else, so far. 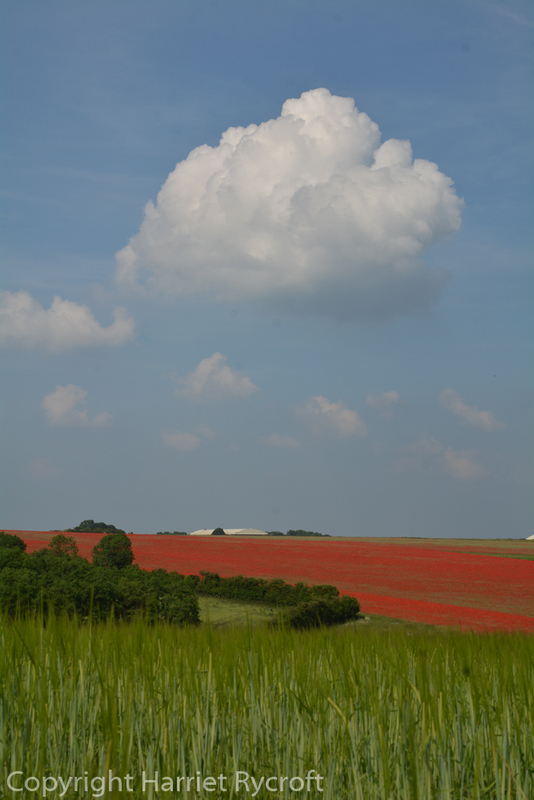 Is it too much to hope for that farming methods are changing? 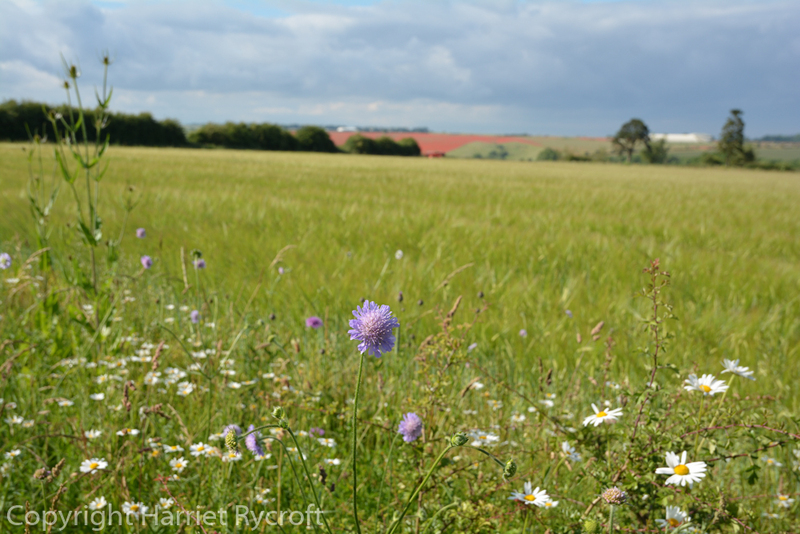 Certainly the fields on my way home are not only splashed with red but also generously margined with white, pale blue and purple. 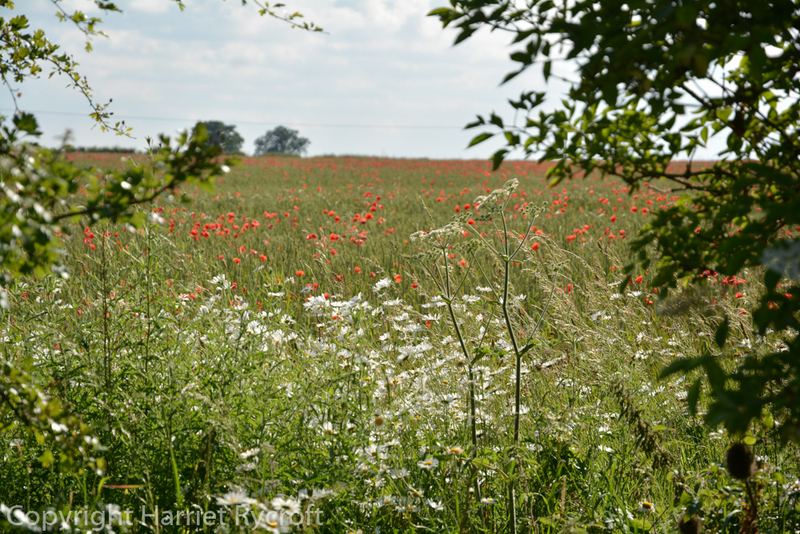 Yesterday’s walk was full of lark burbling and the wheezy song of the yellowhammer, while butterflies animated displays of flowers which would rival most garden borders. I pray this is a trend in agriculture and not a blip. 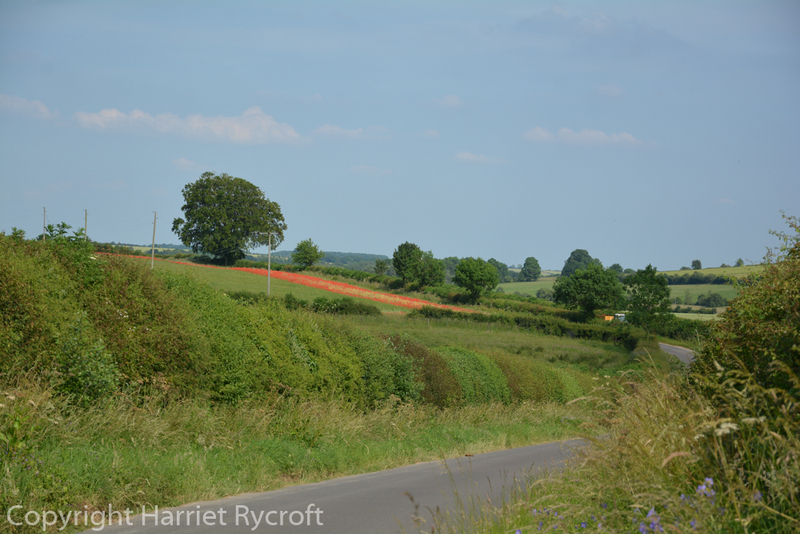 At any rate, hurray for farmers who don’t cultivate right up to the hedge line or blitz their crops with weedkillers! 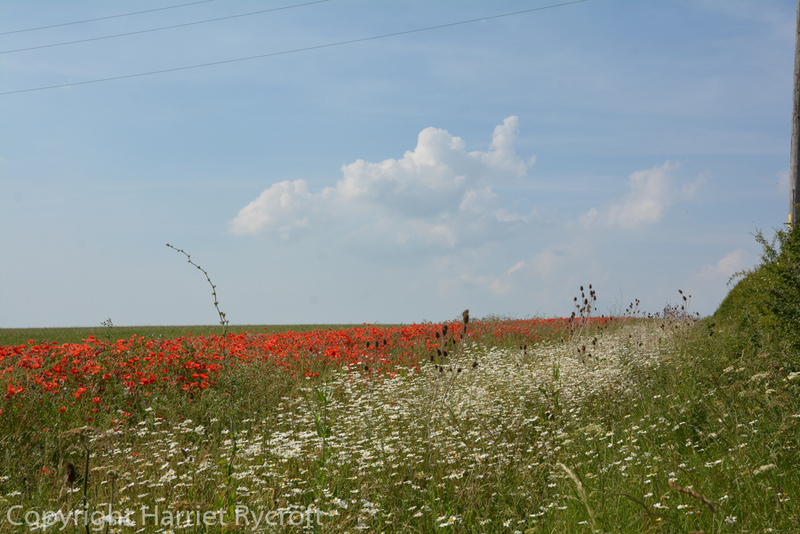 Which flowers make you stop the car and get out? That red! Even (especially) on a dull day it makes your heart leap. Beautiful, beautiful, more than enough to lift my spirits. Thank you for sharing. Glad to be of service, Alison! 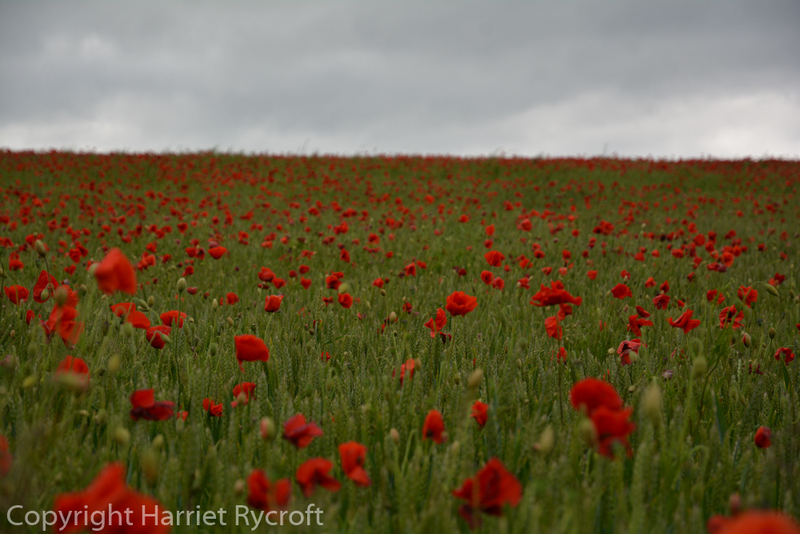 I’ve never seen a field like this in my life so thanks for the pictures – must have been stunning in real life. Wow! that is beatiful! Thank you for sharing these pictures! Do you have any tips on how to get there? I am going to Cotswolds and definetely want to see that! 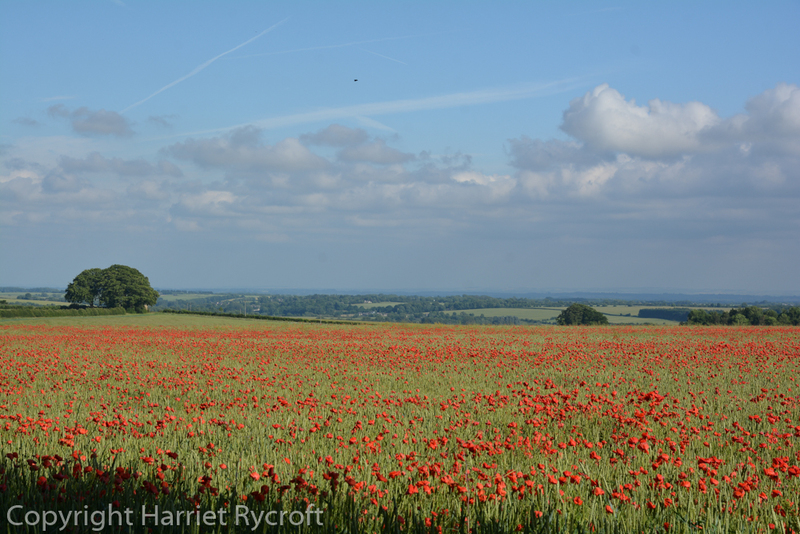 Hi Mariana,you may see a few poppies if you come here in the summer, but late June is the best time to see whole fields of poppies. 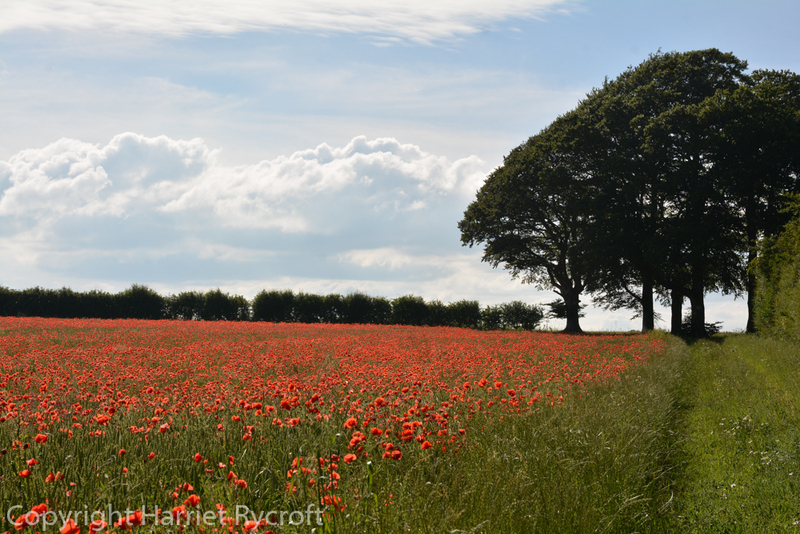 It is hard to predict where the poppies will be because it depends what crop the farmers are growing in their fields that year and whether they use weedkiller or not. So it’s a bit unpredictable where they will pop up… It’s a matter of luck I’m afraid. 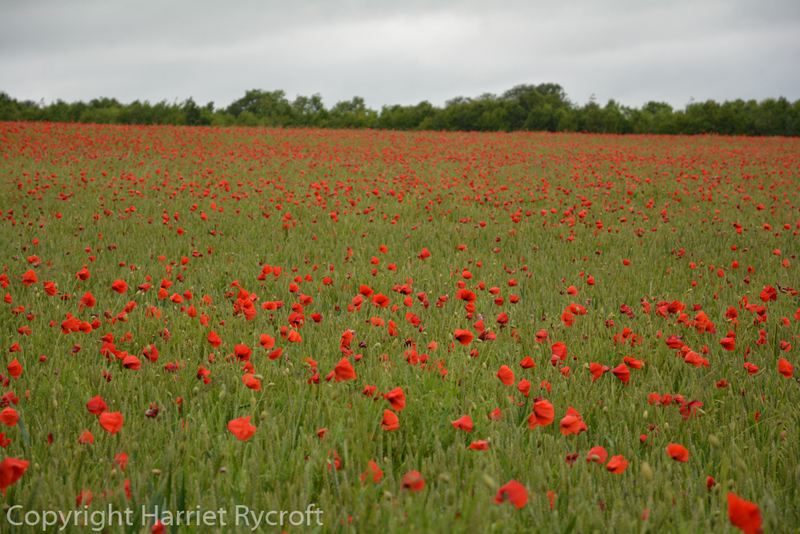 Some years I don’t see any poppy fields but this year I saw several. 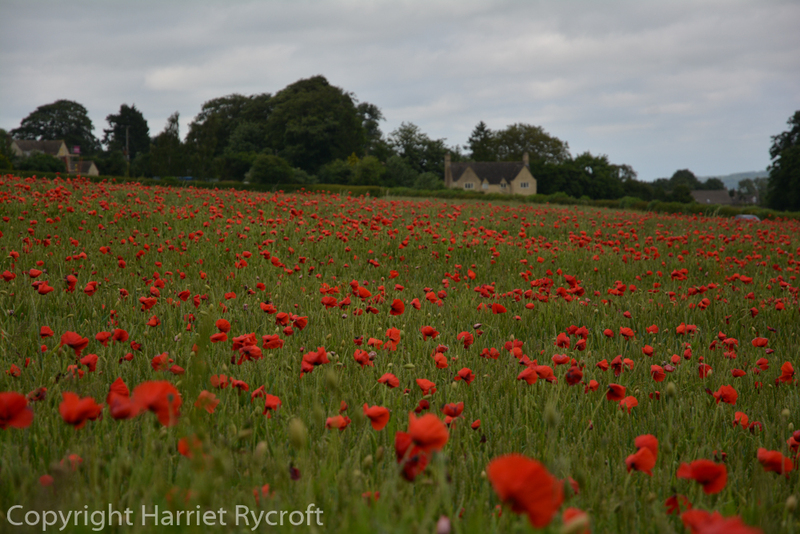 But there are plenty of other lovely sights to enjoy in the Cotswolds!